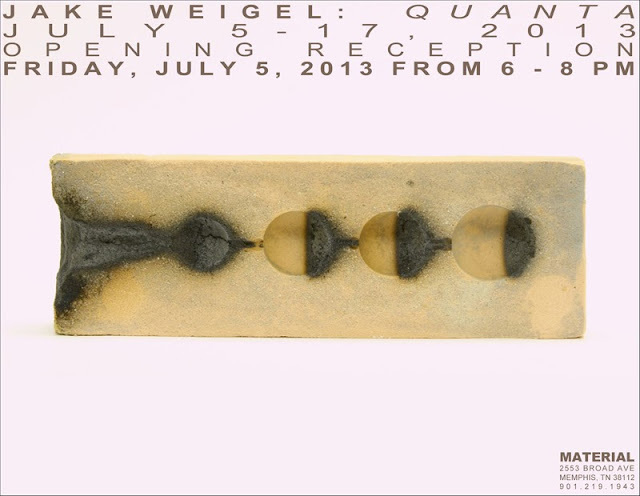 Material is excited to announce its one hundred-fifth exhibition, Jake Weigel: Quanta. Quanta will run from Friday, July 5 through Saturday, July 27. The exhibition will open with a reception on Friday, July 5 from 6-8pm. Jake Weigel was born and raised in Marshfield, Wisconsin. He received his BFA in Studio Art from the University of Minnesota in Minneapolis in 2008 and his MFA in Sculpture from the University of Mississippi in 2013. Time spent after Weigel’s undergraduate studies included working at the City of Rocks National Reserve in Almo, Idaho and traveling extensively. His explorations covered nearly all of the states west of the Mississippi River, visiting the southern United States and an in-depth look into his home state of Wisconsin. These largely solo expeditions further influenced Weigel’s interest in the relationship between humans and nature, concepts involving landscape as space and the void. In the summer of 2011, Weigel traveled to Europe which further informed his work through various interactions, specifically in Iceland, Sweden and Spain. Weigel moved to Oxford, Mississippi in 2010 to attend the University of Mississippi where he will be an adjunct instructor this coming year. His previous interests, paired with an interest in multimedia production, allowed him to study new concepts of space through several mediums and technology. He has had art shown nationally and internationally including exhibitions in Minneapolis, New York, United Kingdom, Sweden, Spain and Hungary with art in upcoming group shows at the Duluth Art Institute and the Center on Contemporary Art in Seattle.